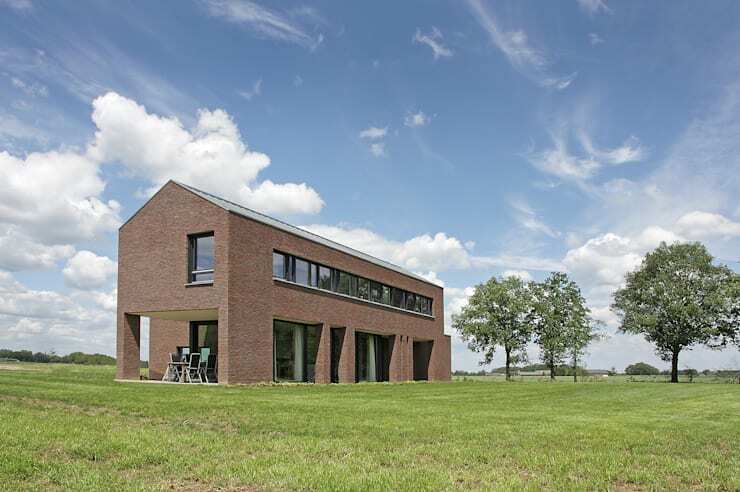 Today, we are going to explore a very modern take on a traditional brick house, where design professionals Benw Architecten have married these two concepts flawlessly. The 2,800 square foot home is strikingly simple from the outside, yet modern and cozy on the inside. Not only will we learn how functionality, style and comfort can work in harmony with one another but we will also see how simple can be more sophisticated. Less truly can be more! Let's take a look at this beautiful home that is unique yet warm and inviting. From this angle, we can see how the brick home takes on a double-storey design with a traditional gable roof. 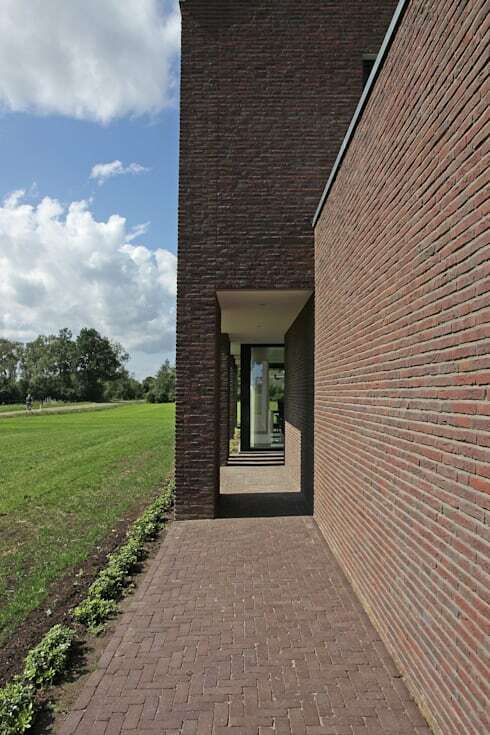 The dark bricks make for a very warm, earthy and simple facade while the shape makes for a modern and contemporary design. The bottom level of the home is very open and interactive with large glass doors opening up onto the gorgeous and expansive garden. The designers have truly worked with the beautiful surrounds, incorporating it into the look and feel of the home. The upper level also features an abundance of glass windows, but there is slightly more privacy on this level, which houses the bedrooms and bathrooms. From this angle, we can see how the home takes on different perceptions, depending on which side you are on. The designers have ensured that the social areas of the home spill out onto the beautiful garden. On the right-hand side, there is a covered terrace where the family can enjoy the sunshine and fresh air. It even features some durable and comfortable furniture, making this space perfect for entertaining or even just relaxing in solitude. At the back of the house, large glass sliding doors open up onto the lush green grass. There is a seamless interaction between interior and exterior. In this image, we can clearly see how the brick facade brings a beautiful yet subtle sense of warmth and texture to the design. This is combined with clean lines and beautiful shapes. 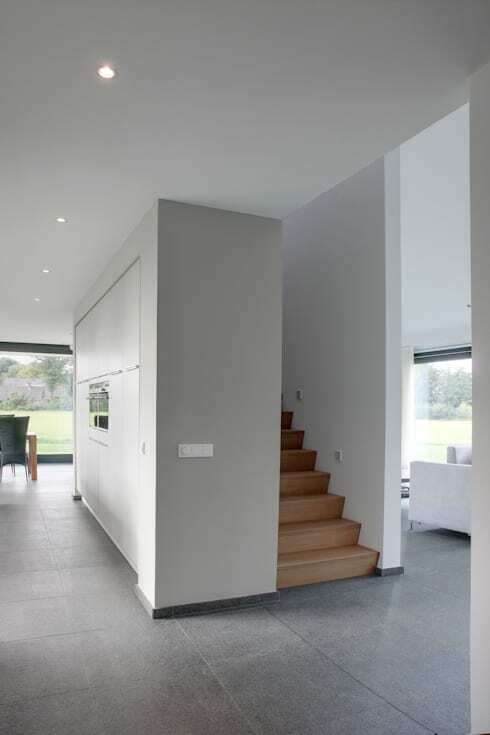 A corridor wraps around the house, allowing for easy movement outside. We also get a little glimpse of the gorgeous views from this angle. The interior space is simply flawless with a neutral colour palette and an abundance of natural light. The designers have gone for grey flooring, white walls and light, wooden touches. This is very simple, but envelopes the family as well as guests and visitors in warmth, serenity and tranquility. The large glass windows and doors that we saw throughout the exterior space allow sunshine to flow into the interior space, making for a light and bright space. The designers have gone for an open plan design, allowing the kitchen, living room and dining room to flow into one another. This creates a truly interactive family home. The large glass windows and doors allow the living area to feel like it is one with the outdoors, while soft, white curtains offer the family some privacy or shade if need be. In the kitchen, we come across a gorgeous kitchen island. This gives the cooking area extra storage space as well as an extra surface for cooking or preparing food. Decorated with a simple vase of flowers, this is the perfect design! The living room is a wonderful example of how functionality and style collide. The designers have gone for grey sofas and neutral colours, using functional items such as the fireplace and the cushions to add personality and charm to this space. Again, we can see how a simple pot plant or vase of flowers can decorate a space without overwhelming it. The windows and doors give this area natural artwork, allowing the family to relax and enjoy the views right from the comfort of the sofa! The design of the home is characterized by natural light, which the designers have achieved by ensuring that there are windows and doors throughout the facade, as we have seen. 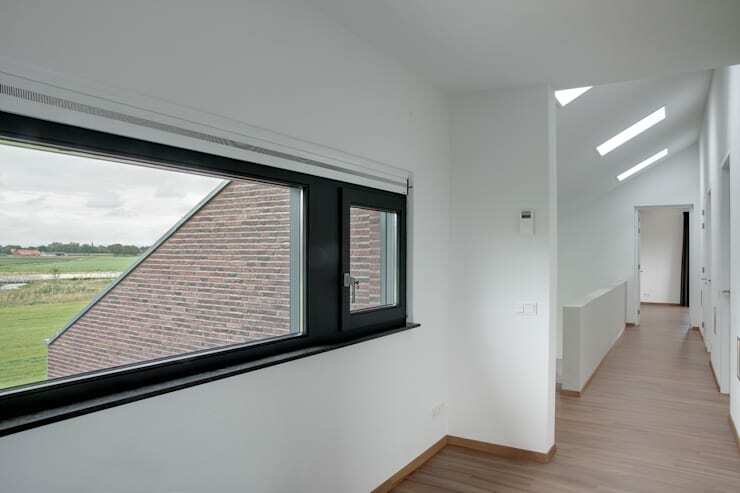 However, as we can see in this image, they've also ensured that there are skylights in the ceiling, allowing the home to be flooded with sunshine throughout the day. If you've enjoyed this home, you'll love this traditional house of 130m² for R890,000 + plans included. 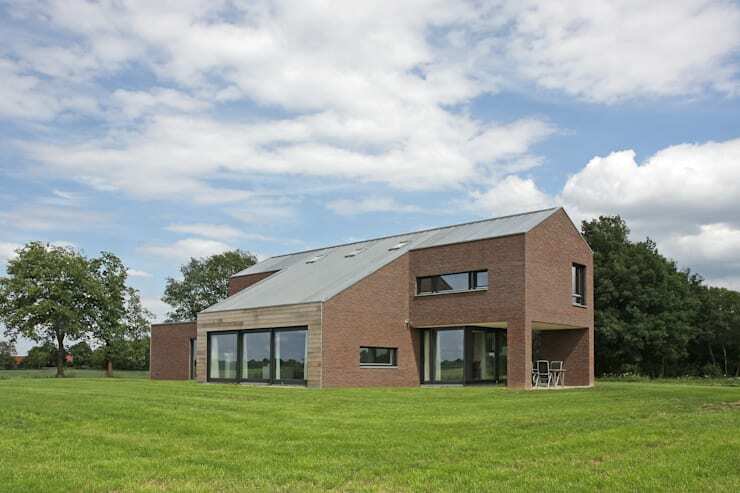 Are you impressed with this modern yet traditional brick home?